Spontaneous perinephric hemorrhage represents a diagnostic and therapeutic challenge. Appropriate treatment depends on the hemodynamic stability of the patient and a correct determination of its cause. In light of its infrequent occurrence, management guidelines for SPH are based on data acquired through meta-analyses of case reports. Since 1933, four available meta-analy-ses have reviewed 448 cases of SPH, 165 of which took place after 1985 (Polkey and Vynalek 1933; McDougal et al. 1975; Cinman et al. 1985; Zhang et al. 2002). It appears that SPH occurs with equal frequency in males and females as well as in right and left kidneys. Flank or abdominal pain of acute onset is the most common presenting symptom (83%-100%) (Zhang et al. 2002; Pe-reverzev et al. 2005). Interestingly, only a minority of SPH cases demonstrate gross or microscopic hematuria (0%-19%). 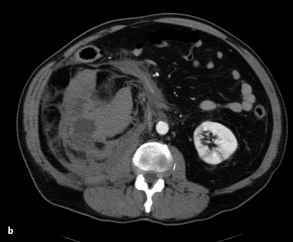 Up to 11% present with signs and symptoms of hypovolemic shock indicative of a severe retroperitoneal hemorrhage. Numerous etiologies exist, the most common of which is neoplasm (57%-66%), benign or malignant, followed by vascular disease (17%-26%), idiopathic hemorrhage (6.7%), and infection (2.4%). 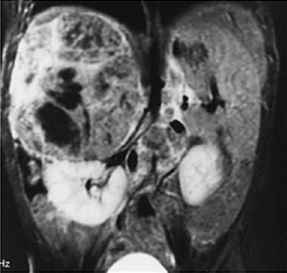 Angiomyolipoma (AML) and RCC represent the most common benign and malignant neoplastic causes of SPH, accounting for 24%-33% and 30 % - 33 % of all cases, respectively. With such disparate etiologic possibilities, accurate diagnosis is of the utmost importance to ensure appropriate treatment is provided. 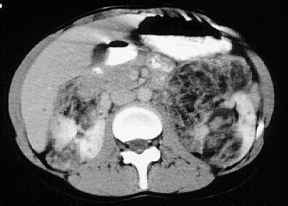 Computed tomography (CT) with intravenous (i.v.) contrast is the imaging study of choice for SPH (Fig. 13.1). The diagnostic accuracy of CT for a perinephric hematoma approaches 100 %, and the reported sensitivity and specificity for identification of an underlying mass is 57 % and 82 %, respectively (Zhang et al. 2002). Contemporary series employing state-of-the-art CT imaging technology report up to 92% diagnostic accuracy for determination of the underlying cause of SPH (Sebastia et al. 1997). In contrast, the sensitivity and specificity of ultrasound (US) is 11 % and 33 %, respectively. Magnetic resonance imaging (MRI) is an appropriate substitute in cases where contraindications to i.v. contrast exist or CT is unavailable. Diagnostic arteriography is indicated if CT or MRI does not demonstrate a mass or if a vascular etiology is suspected (Za-goria et al. 1991). Bilateral SPH, reported in 3% of cases, suggests a vascular diagnosis such as polyarteri-tis nodosa (Zhang et al. 2002). Fig. 13.1a, b. Spontaneous right hemorrhage. a, b Contrast-enhanced CT demonstrating right renal hemorrhage into perinephric space. No mass lesion is discernible. Patient was subsequently diagnosed with renovascular disease al. 1988; Lemaitre et al. 1997). In contrast, any heterogenous solid or cystic mass without fat should be regarded as RCC until proven otherwise. Of note, tumor size does correlate with risk of hemorrhage for AML; however, no such correlation has been shown for RCC (Zhang et al. 2002).